With a brand new Forms Portable template project created in Visual Studio 2015 Community Edition, after updating to Forms 1.4.4 in all projects and then adding a new XAML page to the PCL project, the InitializeComponent() method call in XAML code behind page constructor is underlined in red with message "The name InitializeComponent does not exist in the current context." However the project does build and deploy to iOS, Android, and WinPhone. 1. Open VS 2015 community edition and create a new Xamarin Forms Portable project. Expected result: InitializeComponent() will not be underlined in red and no message about not existing in current context will be displayed. Actual result: InitializeComponent() is underlined in red with message "The name InitializeComponent does not exist in the current context." 6. Go back to the code behind page. The red underlining should be gone and no more error message about not exiting in current context. I added and removed the x:Name property from the XAML page's Label a few times and the issue followed with each change. Also note again that all of the app projects could build and be deployed without error. And then all of the sudden the issue disappeared for me. When I launched the Android project to the XAP, I was prompted to disable Hyper-V, which I did not do right away, but after disabling Hyper-v and restarting Windows, the issue no longer occurred. Likely unrelated but thought I would mention it. Issue reappeared after I built for the Android emulator (and having removed the x:Name property from the Label). Project still builds and deploys though. As a further test I added a sec one XAML page to the PCL project and noted that adding the x:Name property to the label in one of the template XAML files resolved the issue on the code behind for both xaml.cs code behind files. I have checked this issue and I am able to reproduce the reported behavior at my end with the following bug description. It seems the generation of the xaml.c.gs in the obj directory is not being done correctly on a build or they may disappear somehow after a successful build . There are a variety of ways they somehow reappear. Like adding a XAML Forms file to the project.. it will go away temporarily, but then the problem will reoccur when you open the solution the next time. This is really weird behavior indeed. What is the last good build of the VS Xamarin software where this does not happen? Or is this happening on all builds w vs 2015? If you unload the pcl project when it is working right and reload it, the .gs files are then  missing too. They somehow disappear! So this is still a thing. And it's brought my work to a grinding halt after an upgrade to Xamarin 4 / Xamarin Forms 2. I can sometimes get it to to work in visual studio (2013 Update 4), but xamarin studio is now even more of a total loss. I've been working around this in Visual Studio 2015 by setting my "Error List" to show "Build only" errors but I would really like my IntelliSense. 4 months and still no fix? I highly suggest emailing support requesting a status update for this bug. Support eluded to not prioritizing bugs if they don't know they are having impact on users, apparently posting here or in forums is not enough. Here is the link to my comment including Xamarin's support response. Anyone having this issue, please email support asking for status so they know the bug is having a major impact on your development so we might be able to finally get a fix. Come on guys - as other people have commented - 4 months!! This adds to my working day, and impacts my performance, spending time trying to sort the wheat from the chaff. This is causing lots of your users lots of hassle. Please ask Santa to fix it ASAP - Please! Wrote to Xamarin support, and got the reply that the issue was elevated and the engineering team is on it right now. This bug seems very closely related to Bug 32988. In particular, the two problems are complementary: saving a change in the XAML file _stops_ Bug 33181, but _causes_ Bug 32988. For any users running VS 2015 Update 1, there is a chance that switching to using VS 2015 Update 1's built-in Xamarin.Forms IntelliSense  might help. Is there any chance of this being fixed in the near future? It is really slowing down productivity as we need to sift through hundreds of "fake errors" to find the real ones. Can someone from Xamarin provide an update? In its current state this bug is impacting productivity quite severely to a point where Visual Studio is basically unusable. Seeing this issue also after switching to VS 2015. 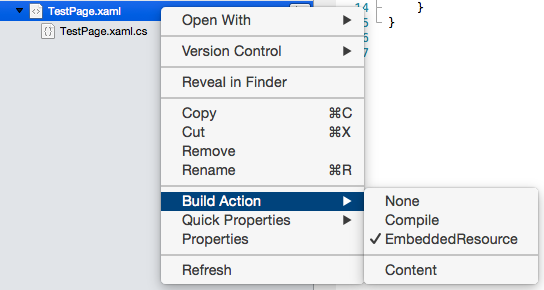 While it might not be the solution, please ensure that your troublesome XAML file's "Build Action" is set properly. I observed a case today that was receiving this error, it turned out that Build Action was set to "None" for the XAML file, when it should have been "EmbeddedResource"
After switching the action, the issue disappeared. Comment 20 shows a screenshot for Xamarin Studio. This bug is about Visual Studio. While the build action of the XAML files is important, it is unlikely to be the cause of the problem for most of the customers on this bug report. In short, feel free to disregard Comment 20. Replacing the Xamarin.Forms.targets file with the version post by @mhutch has temporarily resolved the issue for me (I am using PCL). I look forward to the next update, Thank you all! Just an update to my previous comment, it seems as if the work around only half fixes the problem. The new Xamarin.Forms.targets file fixed the intellisense error for InitializeComponent(), however after I build/stop the project, references to my other assemblies "break" (i.e. they incorrectly become underlined as invalid). Also, the update to the targets file breaks the build in Xamarin Studio so now both environments have issues. We are paying a significant amount of money for the Visual Studio Integration and we are currently unable to use it. Can you please let us know when this issue will be fixed. This issue has been present for several months which is concerning. We're working on, Roslyn has changed a lot about how generated files are picked up and it is a non-trivial thing to fix. Worse there are incompatibilities with how Roslyn and XS work. Getting something to work on XS VS 2012/13/15 all at once may not even be fully possible right now without heavy conditioning. This will make it so the IDE doesn't report a huge list of errors to you when building and will ensure resharper shows you a clean status. Hm? I do have several elements in my XAML with x:Name attributes, but VS still doesn't know the InitializeComponent() method in the code behind. What's worse, it also doesn't know the elements where I set x:Name and I therefore don't get intellisense for those objects. We used Shared Project with XAML and have the same issue. would the fix on Comment 22 work for us? We are using latest version of Xamarin with VS2015. No word in 2 weeks - any updates on this? Has someone found a workaround maybe (and thus the silence)? I have fixed the remaining errors in the templates. The change will be available (probably) in the next release of XamarinVS. 1. The UWP is missing a nuget package. Adding "Microsoft.NETCore.UniversalWindowsPlatform" will make the weird "Can't find System.Object" errors go away. 2. The references to the PCL are missing information needed by VS to properly compile them for intellisense. That is what produces the "Class App not found. Are you missing a reference or namespace?" type errors. The simple workaround is to remove and re-add the references from the App projects to the PCL. There is also an Android error that is not related but may happen. That error ends up in about 1000 errors in the Android project. The simple solution to that is to install API Level 23 from the SDK manager. Unloading and reloading the Android app project may be needed. I'm closing this as resolved for testing and verification. @Joaquin Jares thanks for sorting this out. Let us know when its in Alpha so we can test it also. I also have this problem, but going to version 1.4.3.6376 or lower helps me to develop for a time being. Have you tried this? Also it seems like it can be related with UWP, because this error does not occur (and dependencies stays as they supposed to) when  building Xamarin.Forms Android or iOS project. No it is nothing to do with UWP, the error occurred again after a while. The exact original steps to replicate as listed in Comment 0 will _not_ show the problem because the `XamlG` task does run once when you first add the `.xaml` file at step 3. But if you delete the `obj\` folder and then close and reopen the solution, you will then be able to replicate the problem as described: no amount of cleaning, rebuilding, or closing and reopening the solution will stop the IntelliSense error. The switch from `CompileDependsOn` to `PrepareResourcesDependsOn` changed the timing of _when_ the `.g.cs` file is generated and registered by IntelliSense. With `PrepareResourcesDependsOn`, the `XamlG` task now doesn't run until the user explicitly saves a change to the `.xaml` file. These lines run the `XamlG` task during the `CoreCompile` target, using Conditions to define more precisely when the task should run. It turns out there is at least one other way to work around this issue. See Bug 32988, Comment 18 for the details. One advantage of the alternate workaround is that it also addresses Bug 32988. It's been a while since I've had this problem, i'm using Xamarin.Forms 2.1.0.6529 and VS 2015 Update 1. And yes, there where two major problems: XAML Intellisense (33181) + Other PCL broken references (32988). The simplest way to reproduce the error was to save the XAML file, and the .CS will start to present errors. I just removed "<Error Condition="!Exists('..\..\packages\Xamarin.Forms.2.1.0.6524\..." from the CSProj file and everything was set. Please include both changes in the next release, I'm sure a lot of people, like me, will be grateful. I forgot to tell you that you need to restart VS after changing the file in order for this to work. It works! Thanks so much you guys! folder (and then restart VS), but it all seems to be behaving itself now. I am currently working on verifying the candidate fix for this bug (that is included in Xamarin.Forms 2.2.0.5-pre2). There are a few subtleties to achieve the best results when using the new candidate fix. I will be filing a follow-up bug report to discuss a couple of those details. I will add a link to that follow-up bug when it is ready. As hinted at in Comment 43, there is one subtle, fairly uncommon situation where the default behavior for this issue in the "GOOD" versions might still occasionally cause some confusion or inconvenience. I have filed a separate in-depth follow-up bug report about that situation: Bug 40666. This entry doesn't get added if one manually changes the property. But it does get properly added when creating new files in VS2015 Update 2. If you remove    <SubType>Designer</SubType> then it seems to work again. Using the latest Xamarin.Forms Shared Project Template as-is without modification, I encountered "The name InitializeComponent does not exist in the current context." when attempting to build the unmodified UWP project. I was able to build the UWP project by updating the Xamarin.Forms nugget package to latest stable. I'm getting this error with the latest Xamarin.Forms 2.3.2.127 (latest stable). I tried the Xamarin.Forms 2.3.3.152-pre2 and the problem persisted. I uninstalled Forms, installed Xamarin.Forms 2.3.1.114 and now it compiles without throwing errors, but the initializeComponent and any other reference to the Xaml files are still underlined in red. This exact bug report can be considered closed at this time. Further discussion of similar symptoms will be discussed on other new bug reports. For example, there is at least one open report of the same IntelliSense error that is in progress: Bug 43835. I've just experienced this option with Visual Studio 2017, I had deleted by obj and bin folders and packages (nuget) to try and flush out a different issue. The only way I could get past this was to right-click on each XAML file list, choose properties, then change the build action to 'content' then back to 'Embedded Resource'. I don't know why, but that's the only thing that worked for me - am I not able to safely delete those folders? Hopefully this comment helps someone else.